It is not uncommon for letters, pictographs and symbols to have deep hidden meanings—even magical power, for cultures around the world have rich histories and stories connected to symbols, letters and written words. Other countries and cultures too have symbols and writing systems that were multi-dimensional, that is, their writing systems in application could not only be read as words and every day messages or chronicles, but also could convey that meanings that were profound, sacred or even used as divination. Below I am sharing an informational graphic on stone age jottings published at NewScientist. As we wonder about how baybayin writing system came about I think it is interesting to look at the symbols marked in stone and found in sites around the world and wonder how communication via symbols began in human history. The chart below focuses primarily on the French caves prehistoric rock art 26 symbols but also gives us a glimpse of symbols found around the world. Genevieve von Petzinger, then a student at the University of Victoria in British Columbia, Canada, [found] and brought together all the records of the markings, found alongside the French cave paintings, to compare them. Under the supervision of April Nowell, also at the University of Victoria, she devised an ambitious masters project whereby she compiled a comprehensive database of all recorded cave signs from 146 sites in France, covering 25,000 years of prehistory from 35,000 to 10,000 years ago. 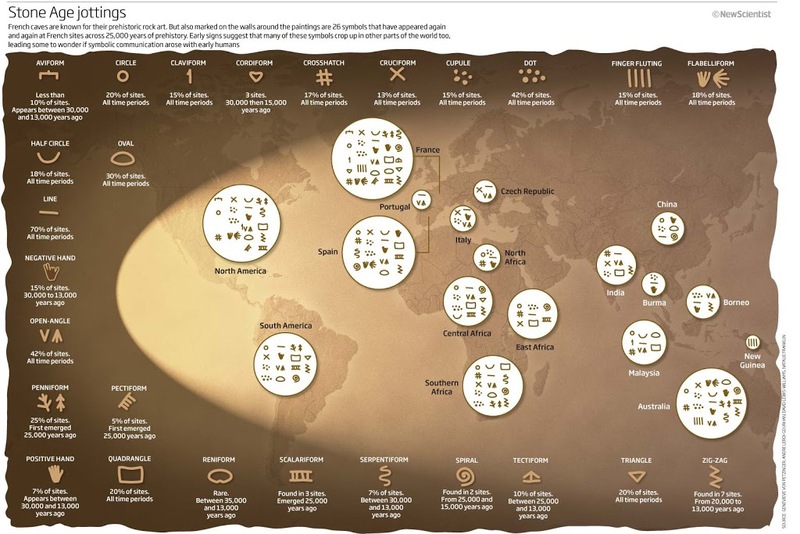 …our ancestors were indeed considering how to represent ideas symbolically rather than realistically, eventually leading to the abstract symbols that were the basis of the original study. “It was a way of communicating information in a concise way,” says Nowell. “For example, the mammoth tusks may have simply represented a mammoth, or a mammoth hunt, or something that has nothing to do with a literal interpretation of mammoths.” Other common forms of synecdoche include two concentric circles or triangles (used as eyes in horse and bison paintings), ibex horns and the hump of a mammoth. The claviform figure – which looks somewhat like a numeral 1 – may even be a stylised form of the female figure, she says. The real clincher came with the observation that certain signs appear repeatedly in pairs. Negative hands and dots tend to be one of the most frequent pairings, for example, especially during a warm climate period known as the Gravettian (28,000 to 22,000 years ago). 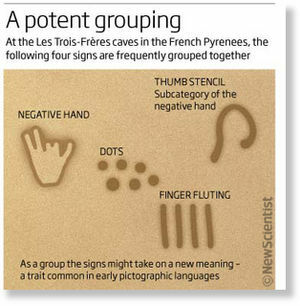 One site called Les Trois-Frères in the French Pyrenees, even shows four sign types grouped together: negative hands, dots, finger fluting and thumb stencils (a rare subcategory of the negative hands). Grouping is typically seen in early pictographic languages – the combined symbols representing a new concept – and the researchers suspect that prehistoric Europeans had established a similar system. “The consistency of the pairings indicate that they could really have had a meaning,” says Nowell. The writing on the cave wall, Kate Ravilious, New Scientist at SOTT.net, Feb 17, 2010.